Did you know you can now order your Deliveroo takeaway from Ben's Canteen here on View? 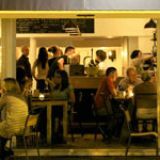 "Ben’s Canteen is an all day neighbourhood hangout; pop in for brunch, dinner and drinks 7 days a week. We’re proud to serve one of the most indulgent brunches in London with great coffee and epic Bloody Marys. In the evenings we serve Steaks, Salads and Big Juicy Burgers alongside cracking cocktails, craft beers and exciting wines. We are dog friendly both in the day and at night." 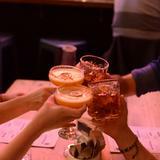 We serve cracking cocktails, craft beers and exciting wines. What did you think of Ben's Canteen? I visited Ben's Canteen last week with the girlfriend and we had two of the best burgers ever! Between us we had the Pulled Pork Bap, the BC Burger and a selection of both Skin on Chips and Sweet Potato Chips :) The girlfriend also enjoyed 2-4-1 on the Peach Bellini while I had the Meantime Pale Ale. 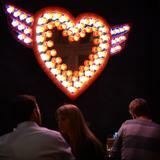 We will definitely be back for the quality of food, nice drinks and relaxed atmosphere. Best egg's benedict in Clapham! It has cured many a hangover! I'm very local to here so have been in several times since it changed management a couple of month ago. When it first opened everyone was very friendly but service was a bit hit and miss - clearly some early teething problems. However, been back twice recently and still very nice guys and there and waiting time much better now. Right from the start the food was excellent though, both brunch and dinner. Steak i had first time was as good as I've had recently and pie night was great. Also a good, and different, selection of beers and wines. Together with some of the other new places on St John's Hill it's now a much better road for a night out than Northcote (if you're over 25). They don"t come much better than this - morning, noon and night. Its a must try and then again and again and again! Great place, great atmosphere, great food and drink, great suppliers and great staff. Tend to end up here quite a lot! Love it! Food is consistently great, ended up dragging myself over for pie night last night (sunday every so often) and nearly had to stay so i could have a second one - opted for take-away in the end. In brief, love the place, good atmosphere, friendly staff, great food (great suppliers), unpretentious and great booze (try the canteen cooler or just stick to a good old caipirinha), what more could you want. Another tip, loving the pork belly, good size portion and definitely not to be missed. Taking you back to the days of yore, Ben’s Canteen takes a look at school-canteen feasting and transforms it into a sophisticated and deliciously creative affair. Huddled on a corner along the ever-popular restaurant and bar scene of St John’s Hill, Ben's Canteen is a modestly branded spot with a simple exterior. What usually prompts plenty of intrigue from passing pedestrians is the scattering of wooden bench tables hosting lively groups of friends, nestled outside under bright blue canopies; seating here is quite the plum spot, it seems. 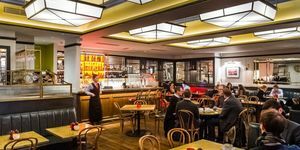 Inside, a long open-plan space plays host to a selection of mismatched wooden tables dotted throughout the restaurant in close proximity, each only a few steps away from a bar that runs the length of the room. Guests catch up with friends along communal worktops, perched in view of diners scattered throughout the lively venue. Meanwhile, attentive restaurant staff dart between tables only to politely prompt the next course or refill an empty glass. 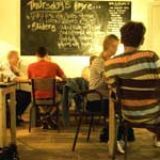 With the food and cocktail menu creatively scribbled onto a dusty chalkboard hung in view of hungry diners (and replicated on neatly folded letter-style bulletins) guests are automatically assured a laid-back atmosphere perfect for both first dates and a lively get-together. In keeping with the canteen-style interior, retro props are dotted around the room to bolster the guests' amusement as they indulge in a quirky and playful feast. Old-school board games are rested on corner ledges (Jenga, anyone? ), while milk bottles act as water jugs, tastefully flavoured with fresh mint and lemon. South-west London signposts bedeck the walls, dishes come served in blue-rimmed school dinner-style bowls and cutlery rests in old plant tins. Thankfully, all these playful bits and bobs don't detract from the main event: the food. Displaying a tasteful array of homemade dishes, the menu doesn’t give too much away when listing the meals on offer. Sticking to simple and classic favourites, the menu is modestly divided into ‘small plates’, ‘bigger plates’ and ‘burgers’. 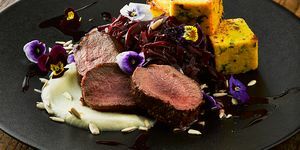 The ‘small plates’ on offer act as bite-size sharers or individual starters, with a wide range of ever-changing seasonal dishes rotating around classic Ben’s Canteen specialities. Grilled squid and chorizo salad (£6) and mussels served with tomato, sumac and giant couscous (£6) are fresh and welcome additions, while inventive delights such as 'Ben’s Epic Scotch Egg' (£6) make for a particularly tasty treat or two; juicy sausage meat and breadcrumbs with mushrooms and bacon neatly envelop a deliciously runny yolk. 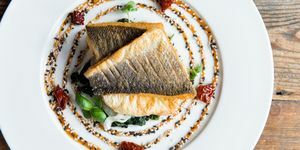 The mains offer a range of choice from fish and salad dishes to meaty feasts. The signature BC beef burger (£9) is plump, cooked on the rare-side of medium rare and layered with salt beef and smoked cheddar. Each bite produces an ooze of meaty juices, slowly submerging into the base of a sweet glazed patty delicately held together by a pierced green pickle balanced artistically at the top. Also leading the ‘burger’ section is Ben’s take on the increasingly popular pulled pork bap (£8.50), which comes bursting with mouth-wateringly tender strings of meat submerged in a tangy BBQ sauce and American mustard. All burgers are served solo and need additional sides such as deep-fried pickles (£4), celeriac slaw (£3) or some excellent skin-on sweet potato chips (£3.50) which are flecked with salt and served alongside all the usual classic sauce accompaniments. The lengthy dessert menu prompts a tempting finale. The raspberry and vanilla brûlée (£5) is a delicate and light choice with a crisp and sugary coating pleasing those with a sweet tooth, while the dark chocolate mousse and salted caramel cup (£6) is a pleasantly rich and creamy treat. If you’re feeling particularly indulgent, the alcohol-soaked ice cream, the 'Snickerbocker Glory' (£9), is a delicious end to a gluttonous feast. With bottles of wine ranging from £17-£33, the impressive and affordable drinks list offers a very good selection, from light and fruity whites (such as the crisp house Loupart, a Savignon Blanc, or Le Campuget Grenache Viognier blend from France) to the rich and bold Perez Cruz Malbec and a nicely structured Carmen Reserva Pinot Noir. The beers come by the pint and bottle, while the extensive cocktail list displays well-made Margaritas and Mojitos, alongside a Sunday morning Bloody Mary that has many a local tongue wagging and many a local hangover cured. This already popular eatery is increasingly on the rise due to its consistently delicious food. This, alongside an extremely affordable price tag and a lovely atmosphere combine to makes Ben’s Canteen one of south-west London's finest.